This week on Jaime’s Lazy Late Night Cooking Corner, the show where I whip up last-minute single serve microwave treats every Thursday while wearing my robe, get your night-cheese on with Single Serve Microwave Cheesecake in a Cup. I adore all things made with cream cheese, so this easy take on cheesecake is pretty much my ideal midnight snack. So far in our series, we’ve made Single Serve Microwave Rice Krispy Treats, Microwave Blueberry Cobbler in a Cup, Microwave Strawberry Shortcake for Two, a Microwave Lemon Bar, and even a Microwave Cinnamon Roll. Now it’s time to watch the video above and learn how to make yourself a delectable little cheesecake. And laugh at me in my robe. In your serving dish, ramekin, or mug, combine cream cheese, egg, lemon juice, sugar, vanilla, and yogurt (or sour cream). Microwave another 30 seconds. Stir. 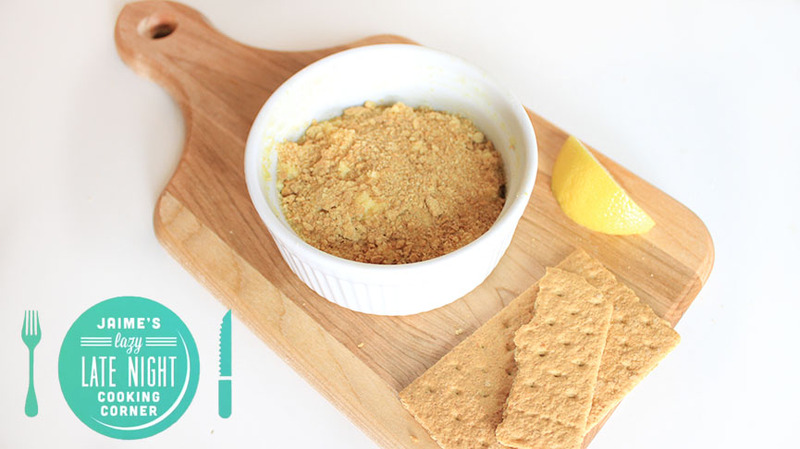 Sprinkle crumbled graham crackers on top. Great idea! Only problem is that I don’t have a microwave… Can this be done in a toaster oven as well? I modified this recipe. I don’t use the egg or the lemon, and I use greek yogurt, and laughing cow cheese instead of cream cheese. I’m trying to be more health conscious and I am lactose intolerant. This is such a great recipe. You can modify it also with chocolate chips, or other flavors to make different types of cheesecake. I also have made this one in a large casserole with strawberries on top for a potluck dinner and it was a great success. also I put the graham crackers on the bottom for a low calorie graham crust. Good concept anyone can make it easily please keep it uyp and posting new receipes. Haven’t you ever heard of crediting your source? You either got this recipe from that site, or somebody who got it there. Posting others recipes without giving credit is Not cool. You’ve also obviously never heard of responding to your readers/comments. Bravo. I know one website I certainly won’t be following. I think you didn’t get a reply because you are arrogant and rude. A simple link to the would suffice. I don’t think the person posting the recipe was trying to be malicious or forgetful. It just was an oversight and you could have put a friendly reminder, if anything. Yes – a very rude couple of comments from princesswilly. Very uncivil. I wish there was more kindness on the internet. It’s way different from the recipe in the link you posted. Obviously they didn’t copy. And, also, there are only a few ways you can make the basic cheesecake recipe and still have it be actual cheesecake, so get over it. Thanks for posting this recipe. I am on a diet, but love cheesecake. A single serve is a perfect treat from time to time. I don’t care if it is posted from somewhere else or an original recipe, just that it is good and easy. Princess, doesn’t the mean girl thing get old? Made this last night; it has a strange texture. Great beat ! I wish to apprentice whilst you amend your web site, how cann i subscribe for a weblog site? I love the concept of easy. This is the first time I looked at this website. It doesn’t matter to me where the recipe comes from originally. My own I never post, people ask and I won’t give out my secrets. PrincessWilly needs to take a chill pill or get a life one or the other. This had great flavor, just a quick question on the texture: mine came out of the microwave looking a little like scrambled eggs, does this mean I cooked too long? I’m using an 800 watt microwave.